As an evolution of Kuwagamon, it evolved more balefully than Kabuterimon-species Digimon. 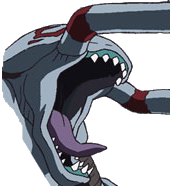 It was enhanced with a particular focus on Kuwagamon's inferior defensive side. As for its offensive side, the reconnaissance ability of its antennae was improved, and the attack accuracy of its scissors was increased. In addition, it has been proven that it possesses not only its survival instinct but also its destructive impulses as its primary traits. It can be said that it is a more aggressive evolved form. Its Special Move is an enhanced version of "Scissor Arms" that can clip through even a diamond with a hardness of 10 (Scissor Arms Ω). — Digimon Adventure 02: "Jogress Evolution, Now, Make Our Hearts Become One"
— Digimon Savers: "The Target is Ikuto!? Gottsumon's Plot"
adj., Oo 「大」 means big. n., Short for Kuwagatamushi 「鍬形虫」 which means stag beetle. 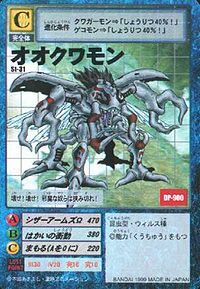 Anime/Manga Digimon Adventure 02: "Jogress Evolution, Two Hearts become One"
シザーアームズΩ Shizā Āmuzu Omega Double Scissor Claw Attacks with its two giant scissor claws that are strong enough to split diamond. 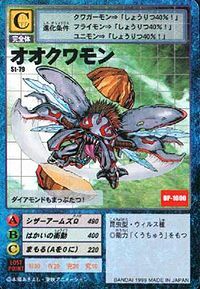 Hakai no Shoudou  Destructive Impulse 破壊の衝動 N/A Beetle Horn Attack/Destructive Impulse Flies into a rage and attacks wildly. 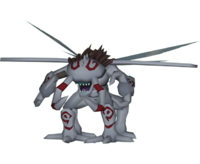 Okuwamon from Digimon Adventure 02. First appeared Digimon Adventure 02 - Episode 26. 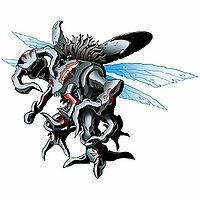 A Okuwamon was among the many Digimon seen through the rip in the sky during Vikaralamon's rampage. 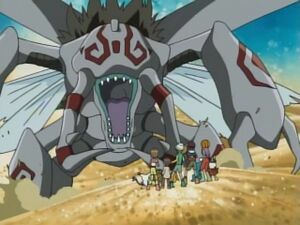 Gottsumon used a Digital Gate he found to transport three Okuwamon to the Real World to attack Ikuto. All but one were dispatched by the DATS team. 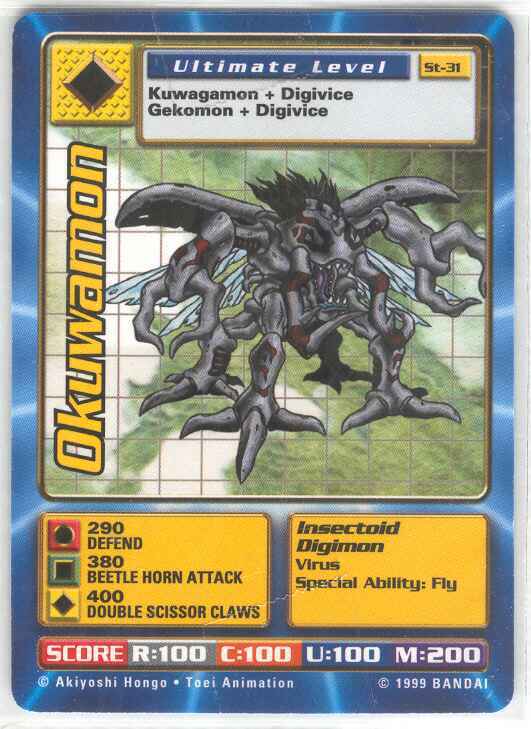 Okuwamon is an obtainable Digimon. 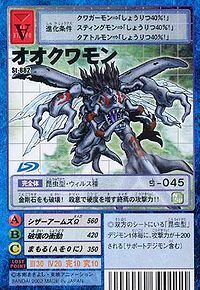 Evolves from Flymon (0+ DP) or Kuwagamon (0+ DP) and can evolve to Gran Kuwagamon (0-19 DP) or Diablomon (20+ DP). Can be evolved from Kuwagamon if above level 19. He can evolve to Gran Kuwagamon if above level 55. 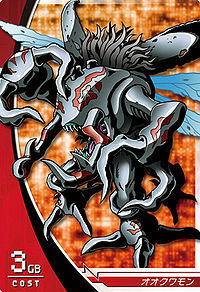 He can be found as part of the boss Digimon at Bug Bug Jungle, along side with Atlur Kabuterimon Red and Gran Kuwagamon during request missions. 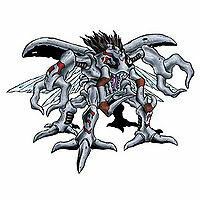 Can be evolved from Kuwagamon if above level 35. defense 145, and Bug Grass EXP 4000, or can be found at Proxy Island. Can evolve to Gran Kuwagamon if above level 49, attack 255, Bug Grass EXP 17000. 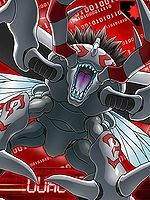 Evolves from Kuwagamon or Gekomon. Can Jogress to Metal Etemon with a compatible Digimon. Destroy! Destroy! I'll cut all those who stand in my way! It can cut even a diamond in two! It can break through even diamond! 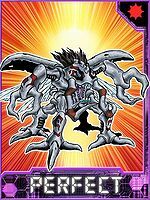 The hardness of its Omega attack power grows stronger with its killing intent!! It slices everything into two! Its destructive impulse makes all shudder in fear!! 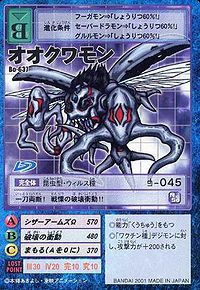 An evolved form of Kuwagamon that has become even more offense-oriented. Not only have its characteristic pincers been further strengthened, and its antennae's reconnaissance abilities been improved, its impressive defense has been strengthened as well. 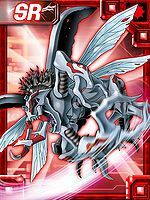 ↑ Digimon Fusion: "Crisis or Conquest"
This page was last modified on 19 December 2018, at 23:56.